This may shock you if you haven´t seen pictures in a while. I see here that I haven't blogged since June. I've been facebooking quite a bit, but some of you don't hang out there. I am working in the school library - LOVE IT!!! It's the PERFECT job! I get to do wonderful story times nearly every day with puppets and real frogs and fun voices ... it´s awesome. I also get to order books and help students find books that they love and enjoy reading! Charles stays busy ALL the time. You might think things slowed down when he graduated, but that is not entirely true. He just took on more projects. I do think he misses seminary. He needs more scholarly conversation! 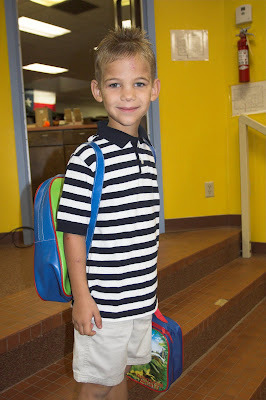 Jonathan started Kindergarten this year. He adores his teacher and they get to do weekly science experiements! He loves school and reading! He started drama this year in Abilene once a week. Kaitlin is in third grade. She also started drama in Abilene this year. She LOVES her teachers and she is finally enjoying math. She is about to start Harry Potter 7, but she usually has 2 or 3 books going at once ... something I could never do. Our church celebrated its 100th anniversary two weeks ago. 217 people came. It was really a blessing. Charles and I celebrate our 4th anniversary here next month ' hard to believe. I´ll try to blog again soon.